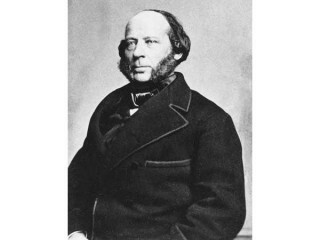 John Ericsson was a Swedish-American naval engineer, born at Langbanshyttan, Wermland, Sweden, on the 31st of July 1803. He was the second son of Olaf Ericsson, an inspector of mines, who died in 1818. Showing from his earliest years a strong mechanical bent, young Ericsson, at the age of twelve, was employed as a draughtsman by the Swedish Canal Company. From 1820 to 1827 he served in the army, where his drawing and military maps attracted the attention of the king, and he soon attained the rank of captain. In 1826 he went to London, at first on leave of absence from his regiment, and in partnership with John Braithwaite constructed the "Novelty", a locomotive engine for the Liverpool & Manchester railway competition at Rainhill in 1829, when the prize, however, was won by Stephenson's "Rocket." The number of Ericsson's inventions at this period was very great. Among other things he worked out a plan for marine engines placed entirely below the waterline. Such engines were made for the "Victory", for Captain (afterwards Sir) John Ross's voyage to the Arctic regions in 1829, but they did not prove satisfactory. In 1833 his caloric engine was made public. In 1836 he took out a patent for a screw-propeller, and though the priority of his invention could not be maintained, he was afterwards awarded a one-fifth share of the £20,000 given by the Admiralty for it. At this time Captain Stockton, of the United States navy, gave an order for a small iron vessel to be built by Laird of Birkenhead, and to be fitted by Ericsson with engines and screw. This vessel reached New York, and there he resided for the rest of his life, establishing himself as an engineer and a builder of iron ships. In 1848 he was naturalized as a citizen of the United States. He had many difficulties to contend with, and it was only by slow degrees that he established his fame and won his way to competence. At his death he seems to have been worth about £50,000. The provision of defensive armor for ships of war had long occupied his attention, and he had constructed plans and a model of a vessel lying low in the water, carrying one heavy gun in a circular turret mounted on a turntable. In 1854 he sent his plans to the emperor of the French. Louis Napoleon, however, acting probably on the advice of Dupuy de Lôme, declined to use them. The American Civil War, and the report that the Confederates were converting the "Merrimac" into an ironclad, caused the Navy Department to invite proposals for the construction of armored ships. Among others, Ericsson replied, and as it was thought that his design might be serviceable in inland waters, the first armored turret ship, the "Monitor", was ordered; she was launched on the 30th of January 1862, and on the 9th of March she fought the celebrated action with the Confederate ram "Merrimac." The peculiar circumstances in which she was built, the great importance of the battle, and the decisive nature of the result gave the "Monitor" an exaggerated reputation, which further experience did not confirm. In later years Ericsson devoted himself to the study of torpedoes and sun motors. He published Solar Investigations (New York, 1875) and Contributions to the Centennial Exhibition (New York, 1877). He died in New York on the 8th of March 1889, and in the following year, on the request of the Swedish government, his body was sent to Stockholm and from there into Wermland, where, at Filipstad, it was buried on the 15th of September. Torpedo technology, especially Destroyer, an advanced torpedo boat. The "solar machine", using concave mirrors to gather sun radiation strong enough to run an engine. The Mall in Washington D.C.
View the full website biography of John Ericsson.